The motion in the barrel of the Tumbler simulates the natural action of flowing water or ocean waves. Beaches and riverbeds contain rocks and pebbles smoothed by water and the abrasive sand it carries. As rocks grind upon one another with constant water and sand in the mix, they begin to round and smooth. Although this is a constant process, it does not however, naturally polish the rocks. The Tumbler uses an abrasive media instead of sand. It is graded by grain size, from fine powder sized grains, up to large sized grains. By changing (usually by weekly intervals) the grain size, rotating from coarse, medium, to fine, the rock or gemstone is smoothed much more quickly than the natural process. To polish using a Tumbler, add a metallic oxide compound (not included). The complete process for a gemstone or rock to go from rough to smooth, polished finish, usually takes 4-6 weeks. Rock tumbling is a fun activity for children of all ages and promotes an interest in geology and science. Introduce your kid to science the fun way. 100% Satisfaction Guaranteed - With a manufacturer lifetime warranty you can be sure you will get a quality gift. Packaging List: Includes tumbler, 3lbs of walnut shell media, and instructions. Professional Features: This high-quality tumbler has a powerful motor, the design allows it to run for days at a time to ensure a smooth finish! 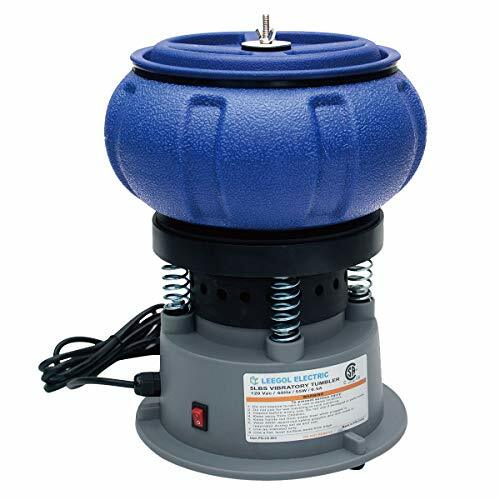 Perfect Rock Tumbler: Easy to use, to polish rocks or metal parts, simply add a media and let the self-rotating tumbler do all the work for you. 100% Satisfaction Guaranteed: With a manufacturer lifetime warranty you can be sure you will get a quality gift. If you have any questions about this product by Leegol, contact us by completing and submitting the form below. If you are looking for a specif part number, please include it with your message.